This is part 5 of 5 of an interview with Art Pollard. Be sure to start reading with Part 1. Leave your questions and thoughts in the comments. Art will be available to comment on anything you have to say. Do you eat chocolate all the time? Yes! It’s now part of my job requirements. Some days I end up eating quite a bit. The days that we are manufacturing chocolate, I am probably sampling from a batch every five minutes or so. It ends up being a lot of chocolate! I keep little cups of spoons velcroed to the sides of each of our machines so we can sample readily all throughout the day. It ends up being quite a bit of chocolate at the end of the day. Do you ever eat chocolate that you don’t produce? On occasion, but to be honest I’m spoiled because I get to make my chocolate how I like it. Nothing against anybody else’s chocolate, but I like it how I make it, so that tends to be what I eat. Do you have any non-work related hobbies? Most everything revolves around chocolate in one form or another right now. I still do our computer stuff and I take care of our current customer base. I haven’t been pushing things as far as increasing my other business. 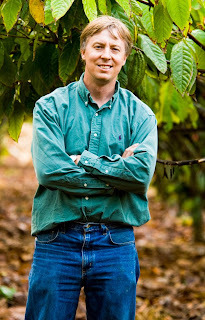 As much as I could, I primarily wanted to grow the chocolate company. As far as outside things, I still do quite a bit of photography. When I was going to school, I came three classes shy of a photography major. I get to do a lot of photography when I go to various cocoa farms and exotic locations. I have to be a little bit careful as to which photos I actually let out because I don’t want to tip my hand into various locations we’ve been visiting, but I have a really nice collection of truly spectacular photographs. I also do take the kids out. I have two kids – both boys, six and nine. We belong to a local high-powered rocketry club. You’ve probably seen those little rockets that kids build. This is kind of like that but bigger - by a lot! It’s pretty common to be launching things up to ten or twenty thousand feet depending on the FAA clearances and so forth. It’s quite a bit of fun and it gets the kids out. We are slowly working on designing a liquid fuel rocket that we will launch one of these days. If you were going to interview one person about food, who would it be? Charlie Trotter. He runs a restaurant in Chicago. It’s one of the best restaurants in the country called Charlie Trotter’s. I have not eaten there. A good friend of mine used to be his head chocolate guy. I’ve admired what Charlie Trotter has done for years and years and it would be a good excuse to get over to Chicago. His pursuit of perfection in food is truly admirable. He even gets the waiters out there to put tape on their shoes so that way when they are doing their waiting, if there is a spec of something on the carpet they can pick it up without being obtrusive. 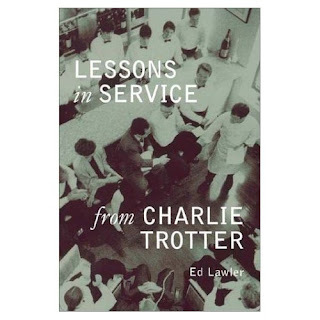 If you want to read a truly great book, it’s called Lessons in Service from Charlie Trotter. It’s well worth the read. It’s really that totally absolute search for perfection in all that you do. It’s a truly good book. Thanks again for this interview. This was a great interview, interesting in so many ways. Art, I admire your search for perfection in the things that you do. Your story is truly inspiring! I have to try this chocolate. Great interview. I'm still drooling over the photo from yesterday. Look forward to more interviews! Great interview. Great chocolate, Great book. He eats chocolate all of the time, and yet looks in shape!! I'm jealous :(. Fantastic interview! I really enjoyed reading all the parts this week! Great interview! Art - have you thought of starting a blog to talk about your travels to various plantations (of course, without giving away too much information)? If there was anyone that you would want to TASTE your chocolate, who would it be? Patty: Yes. We will be doing a blog. I just set up an account with WordPress the other day and am just starting to set things up. One day, I was working on our website at home. I had been working pretty hard on getting things just how I wanted it. Because of this, I was pretty tired. I went downstairs to take a break and my wife was watching Oprah. I sat down to watch it with her. That particular show, Oprah had Queen Noor as her guest. Amazingly, the topic of conversation turned to chocolate. Oprah made the comment that she was always looking for the "ultimate chocolate experience" and Queen Noor quickly agreed. I felt like screaming: "The Ultimate Chocolate Experience is Here!!!" but clearly she couldn't have heard me. I've never forgotten that moment and the utter helplessness I felt at that time. After all, here is someone who clearly appreciates chocolate and seeks out the very best -- and there was not a thing I could do to reach her and simply say: "The ultimate chocolate experience is here. Try this and please, tell me what you think." Thank you for the interview! Lucky you, being able to eat all the chocolate you want! That sounds like a dream job to me! Great interview! I'm so jealous - lots of free chocolate sampling every day.... I would be in heaven! Wow, chocolate sampling for work...ah, if only!